Interview: Entre Nous with Daniel Weinstock, McGill Reporter, September 2012. 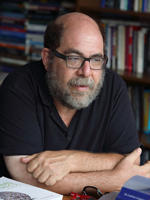 Previously a Professor of Philosophy at the Université de Montréal, Daniel Weinstock held Canadian Research Chair on Ethics and Political Philosophy. He was also the director of the Research Centre on Ethics at Université de Montréal (CRÉUM) for many years. He is also a member of Centre d'études ethniques des universités montréalaises (Université de Montréal). He joined McGill’s Faculty of Law in August 2012. Weinstock's research explores the governance of certain types of liberal democracies, and the effects of religious and cultural diversity from an ethical perspective on the political and ethical philosophy of public policy. A graduate of McGill and Oxford (DPhil in philosophy), he studied under Charles Taylor, and at Harvard University, he also studied under John Rawls. He is a prize fellow of the Pierre Elliott Trudeau Foundation (2004), and a recipient of the André-Laurendeau Prize given by the Association canadienne-française pour l’avancement des sciences. His areas of expertise include the politics of language and identity, democracy, citizenship, and pluralism. He has published many articles on the ethics of nationalism, problems of justice and stability in multinational states, the foundations of international ethics, and the accommodation of cultural and moral diversity within liberal democratic societies. He has also been an active participant in public policy in Québec, having been a member from 1997 to 1999 of a Ministry of Education working group on religion in public schools, and from 2003 to 2008, the founding director of Quebec’s Public Health Ethics Committee. He holds a DPhil in philosophy (University of Oxford), and an MA in political philosophy and a BA in French literature and political philosophy (McGill University). He was appointed Director of the McGill Institute for Health and Social Policy in 2013, and named a James McGill Professorship in 2014. Professor Daniel Weinstock was awarded the 2017 Charles Taylor Prize for Excellence in Policy Research by the Broadbent Institute.